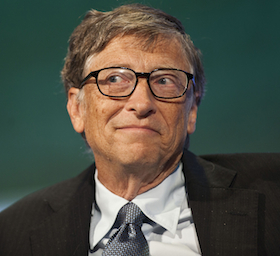 In Paris today, Bill Gates is expected to announce a 28-member investment coalition. Bill Gates, leader, Breakthrough Energy CoalitionRay Dalio, George Soros, Mark Zuckerberg, Jeff Bezos, and 23 other ultra-wealthy individuals have joined the University of California (UC) in a clean energy investment coalition, according to the UC. Bill Gates—Microsoft founder and famed philanthropist—led the group’s formation and is expected announce it in Paris at the opening of COP21, the United Nations Climate Change Conference. UC is the sole institutional asset owner involved in the Breakthrough Energy Coalition. The nearly-$100 billion organization has committed $1 billion for “early stage and scale-up” clean energy investments over the next five years, UC said, plus $250 million for relevant ideas out of the university system. Gates called California’s post-secondary network—“with its world leading campuses and labs”—an ideal partner for the group’s “ambitious” goals. UC “produces the kinds of groundbreaking technologies that will help define a global energy future that is cheaper, more reliable, and does not contribute to climate change,” the Microsoft founder said in a release ahead of the Paris announcement. This energy group is the second recent initiative between UC and Ratan Tata, coalition member and ex-chair of Indian conglomerate Tata Group. Last week, the “business legend” signed on to advise UC on international policy, including Asian and subcontinental investment opportunities. The private sector will ultimately develop the breakthroughs needed for a zero-carbon energy future, Gates said, but the private sector alone cannot alone bankroll foundational research and development. That is where the coalition aims to come in. “I hope even more governments and investors will join us,” he concluded. A separate project to reduce the carbon output of investment portfolios—the Portfolio Decarbonization Coalition (PDC)—is also set to announce new members at the COP21 conference in Paris this week. Last week the PDC announced it had swelled its members to include Hermes Investment Management, Dutch asset manager MN Services, BNP Paribas Investment Partners, and French investors Humanis and Caisse des Dépôts. The coalition now covers more than $230 billion in assets under management, more than double its initial $100 billion target.